Grinding: Grind your beans a bit finer than you would for an espresso to slow down extraction. Load portafilter: Dose 7-9 grams of ground coffee for a single shot basket portafilter. Place the portafilter back to the grouphead and start brewing. Extraction: Yield 15 ml of liquid at around 20 seconds. 2 What Is a Ristretto? 3 What Is a Café Ristretto? 4 What Is a Ristretto Shot? 5 What Is a Ristretto Bianco? Short Answer: A Ristretto is a "short (restricted) shot" of espresso, that is more concentrated, sweeter and richer in flavor. Before we can get into the fine art of making a Ristretto (which is an excellent drink that you’re almost certain to fall in love with), we first have to answer the question “What is a Ristretto?” The best way to do that is to explain it in the context of two other drinks: The Espresso, and the Lungo. All three are closely related, with the Ristretto and the Lungo both being in the same family of drinks as the Espresso – they are just different manifestations of that drink, with very different characteristics. You’re probably familiar with the standard Espresso. It is the "base" or go-to drink at coffee shops around the world, and is characterized by its bold flavor, bitterness, and acidity. It can be enjoyed on its own, served by the shot, or added to just about any other coffee drink to give you a jolt of caffeinated goodness that supercharges your drink. It takes about 25 to 30 seconds to make a standard espresso. During that time, hot water is forced through tamped coffee ground at about 9 bars of pressure (1 bar = atmospheric pressure at sea level). The resulting shot is bold and flavorful, and for many people, too intense to be consumed on its own. The Ristretto is a “restricted” (which is what the word literally means) form of an espresso. 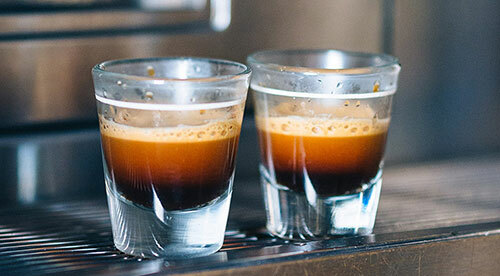 This also known as the "short shot" because the shot is literally "cut short" to the beginning phase or the first ¾-ounce of espresso in an extraction. 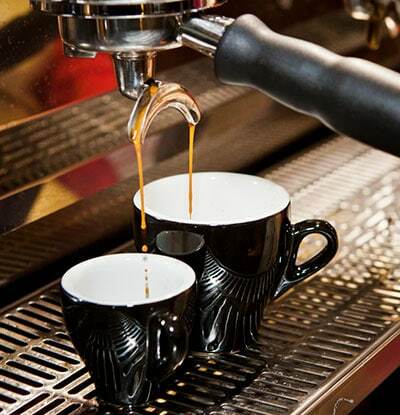 Basically, a ristretto shot is made by following the same extraction procedure for an espresso, but using less water. If you want to brew your ristretto at a similar time as with an espresso, you need to grind the beans a bit finer than usual to slow down the flow of hot water during extraction. However, a less complicated process, usually done by baristas today, is to simply use the same grind size and amount of ground coffee as with an espresso, but pull the shot at around 15 seconds (about half the time of a regular espresso extraction). On the face of it, you might think this would result in the same flavor, but half as much. But, here’s the magic... the taste is completely different! It turns out that by only extracting for fifteen seconds, the end result will be a much milder, even sweeter drink that you can consume on its own. The extra fifteen seconds of extraction is where the acidity and bitterness of an espresso comes from. So, if you’ve ever heard someone at your favorite coffee bar ordering a Ristretto (or more commonly a Double Ristretto, which is the same volume as a standard espresso (~30 ml), what they’re getting is a very different drink compared to those who ordered a regular espresso or had their shot added to their favorite coffee drink. It is, by most accounts, a superior product. 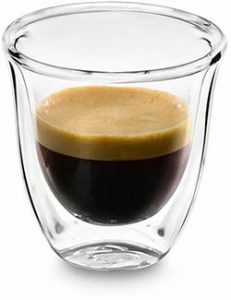 In fact, if you order a Ristretto at a coffee shop, most baristas will automatically give you a double shot. This is mainly due to the fact that a single shot of ristretto is usually just half an ounce. Surely, you'd want to drink more than 15 ml of coffee at a coffee shop! Plus, most coffee shops prefer to use a double basket to prepare their coffee drinks. It's just more efficient than changing from single and double baskets in between orders. For the sake of completeness, before we go into detail about making a world-class Ristretto, we need to talk about the Lungo, too. Lungo means "long" in Italian, and in espresso terms, known as the "long shot". Basically, a lungo is prepared just like a regular espresso but using more water by letting the extraction continue for more than 30 seconds. Usually, a single shot of lungo is 45 to 60 ml, about double the volume of a single shot of espresso, with more solubles and more caffeine than the ristretto or the espresso. 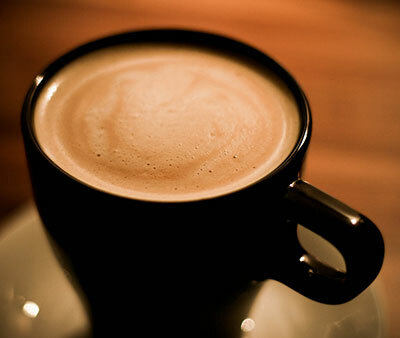 Lungos have a thinner body and a dryer and more acid taste. Because of the added water, the Lungo isn’t as strong or concentrated in flavor as an espresso. But because of the longer extraction time, it is more acidic and bitter. Which espresso variant you prefer will ultimately come down to personal preference. Some people love strong, robust coffees, others prefer the bitter flavor, sometimes cut with sweeteners or other ingredients, while others prefer the milder taste of the Ristretto. The only way to find out for sure which one you prefer most is to try them all -- an experiment well worth taking the time to do! What Is a Café Ristretto? What Is a Cafe Ristretto? Short Answer: The Spanish term for "Ristretto". We usually see the terms "Ristretto", "Café Ristretto" and "Caffè Ristretto" used interchangeably in various coffee shops that some people have found these terms confusing. However, as explained above, "Café Ristretto" is just the Spanish term and "caffè ristretto" is the Italian for the more literal meaning of ristretto, which is "restricted coffee". What Is a Ristretto Shot? A ristretto shot is exactly that, a shot of ristretto. However, as mentioned above, most people who order a shot of ristretto at coffee shops actually get a double shot of ristretto. Since an actual shot of ristretto is just half an ounce (~15 ml) of a regular espresso, which is a very small amount for one to enjoy, the barista prepares a double shot to get an ounce (~30 ml) of ristretto just like a standard espresso. What Is a Ristretto Bianco? Short Answer: A smaller-sized café latte made with ristretto, rather than espresso. ​Again, a bit of explanation is in order here, using espresso as our basis for comparison. 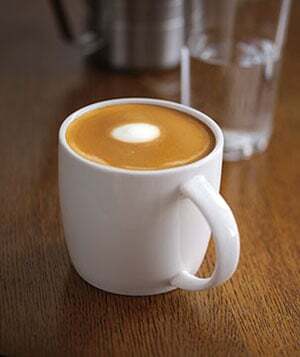 A latte is a sweet coffee drink made from one shot of espresso, six to eight ounces of steamed milk, with foam on top. If you order it without the foam on top, it’s called a “Flat White,” but is essentially the same drink. In the US, since coffee sizes tend to be larger here (12 ounces at least), most coffee shops prepare lattes with a double shot of espresso. A ristretto bianco then, is a café latte, made with a double (or quadruple, depending on the size of the drink you’re ordering) shot of ristretto, with steamed milk and foam poured atop it, and they are delicious! Lattes tend to be fairly sweet drinks anyway, and a well-made ristretto shot will only enhance these characteristics. Each model’s controls will be slightly different. If you have a super-automatic, it may be the case that it’s got ristretto already programmed into the menu. Try it using the default settings first, and tweak to taste from there. If ristretto is not pre-programmed, then espresso almost certainly will be.Start with that programming and change the settings so you’re getting 15ml of output over 15 seconds, instead of the espresso’s 30/30 configuration, and that’s all there is to it! Set your grinder to grind your beans fine as you’d normally use when making espresso. Load the grounds in a double basket portafilter and tamp just as you normally would. Attach the portafilter to your espresso machine and begin extraction. Set a timer until you’ve ingrained this into muscle memory. Since this is a double shot, you’re looking for 30 ml of ristretto (if using only one cup), or 15 ml of ristretto (if using two cups), with an extraction time of around 15 seconds. Nespresso is a line of pod-based espresso machines produced by Delonghi. They’re functionally similar to Keurigs and other pod-based brewing machines, but more specialized, and the Pixie is smaller and more compact. It’s also the company’s best-selling product, owing in large part to its modest price. When the machines were first launched, Delonghi / Nespresso had a monopoly on the pods for their machines, but since they’ve grown in popularity, you can find other companies that make “Nespresso Compatible” pods, which may save you a bit of money. Making a ristretto with the Pixie is super-easy, because not only is the machine itself pod-based, but the company actually sells special ristretto pods. Making one is as simple as filling the Pixie’s water reservoir, inserting a ristretto pod, pushing the button, and waiting for your drink! This is another, slightly more robust, and moderately more expensive espresso maker by Nespresso. From a ​practical standpoint, there’s no difference between making an espresso using this model than there is when you use a Pixie. Being pod-based, it’s just a matter of buying the right pod, inserting it, then sitting back and waiting for your drink! One thing that’s worth noting about the Citiz is the fact that this model comes with a milk frother. The smaller Pixie does not, but you can buy one separately. The milk frother, combined with a fast, easy way to make great espresso, ristretto, or lungo, makes it possible to use this model to make all your favorite specialty coffee drinks. 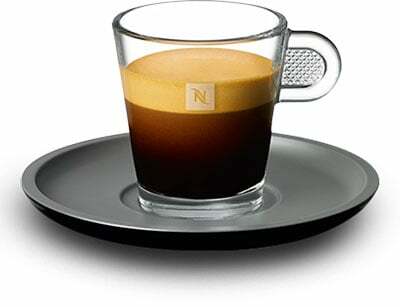 The Inissia is Nespresso’s latest product offering. It is functionally similar to the Pixie, with a slightly smaller footprint, and made of less expensive materials. If you’re on a budget, this is one of the cheapest ways to break into the world of specialty coffee drinks! In terms of making a ristretto with the machine, it’s the exact same process you go through with Nespresso’s other models. Again, being pod-based, there’s not much to do other than to make sure you’ve purchased the right kind of pod (which will be marked as a ristretto pod). Many people regard the ristretto is being the ultimate coffee experience. If you’ve been contenting yourself with adding a shot (or two!) of espresso to your favorite coffee creations, you owe it to yourself to give the ristretto a try to see which one you like better. If you’re very brave, try a straight espresso then compare it to a straight ristretto. That’s the very best way to experience the flavor difference between the two – then, once you’ve conducted your experiment, stick with whichever one you like best!